This article was originally published in the March 22, 2017, edition of the Sun. Running from Foster to Highland streets through the heart of downtown Worcester — and never more than a few blocks away from the infamous incline of George Street — is Major Taylor Boulevard. 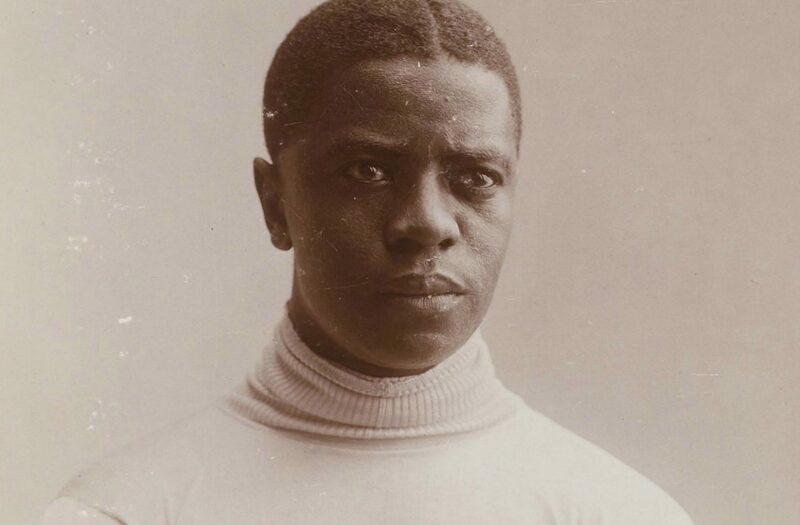 The bustling thoroughfare is named after Marshall “Major” Taylor, a pioneering athlete who trained to become the first black world champion cyclist in 1899 by repeatedly sprinting the steep 500 feet between Main and Harvard streets. The second world-champion black athlete, after boxer George Dixon, Taylor’s grueling workout inspired an annual fundraising event at George Street that continues with its 15th edition in July. The American sprint champion in 1900 and one-time holder of seven world records, Taylor retired in 1910 at 32 years old, fell on hard times and died destitute at 53 in a Chicago hospital, his legacy all but forgotten already. Taylor moved to Worcester from Indiana in 1895 at the age of 15 with his trainer and mentor, Louis “Birdie” Munger, who was planning to open a bike factory in the city but also seeking a more tolerant atmosphere for Taylor than existed in the Midwest. He purchased a home in the Columbus Park area of Worcester, a “well-to-do” neighborhood at the time, where the neighbors were alarmed that a black man was moving into the area and even offered to pay him double the amount he paid for his home just for Taylor to move. Tolman said that after a short time, Taylor’s neighbors realized he was “a distinguished gentleman” and got over it rather quickly. The Major Taylor monument outside the library. 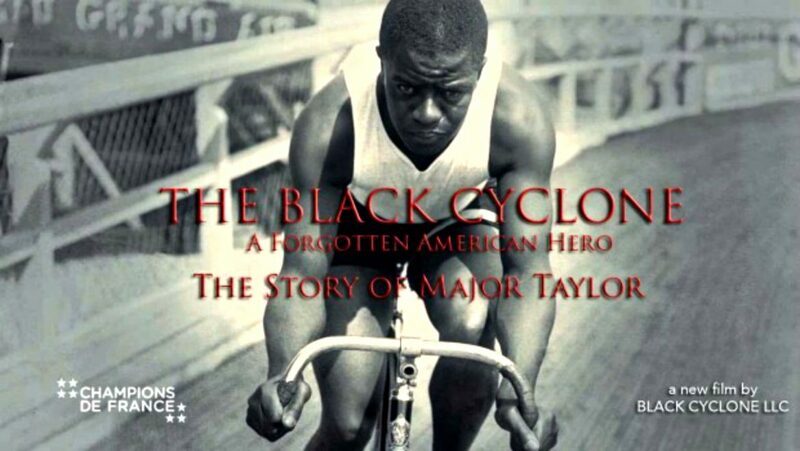 The film’s tagline is, “The greatest sports hero that America has forgotten.” In “The Black Cyclone” filmmakers hope to capture the essence of Taylor’s life, from his childhood as a coachman’s son working for a rich white family, to the discovery of his talent as a trick cyclist, to his success on the racetrack, and the racism and other struggles he endured along the way. “This is an inspirational story and that’s how we see Major Taylor’s life,” Bahati said. “With Major being a young man in the Midwest, and being able to come through, with all he had to endure as an African American, and being a champion of a sport right at the turn of the century and one of the fastest men on a bike — it’s a very inspirational story on so many different levels. With the support of Tolman and the Major Taylor Association and a slew of cycling acumen — Howard is a former Olympian cyclist and Hall of Famer, and Bahati’s son, Rahsaan, is a seven-time U.S. National Champion cyclist — the one thing filmmakers could use more of, is money. They are seeking $10,000 through an Indiegogo campaign. As of midday Tuesday, March 21, the campaign had raised $2,390 through donations from 30 backers. Funding for the film will cover the costs of research and development, and business planning for landing a production studio and major distributor. “We hope that this movie brings his story to a much wider audience. It isn’t only about cycling or athletics. We admire him not only for his athletic achievements, but for his strength of character,” Tolman said. Among the donation “perks” organizers are offering the chance for donors to see their names during the on-screen credit roll (starting at $100); receive complimentary advanced screenings of the film (starting at $500); make background cast appearances in the movie; and get cycling sessions with Howard and Rahsaan Bahati (starting at $1,000). Bahati said he is encouraged by the early response, including requests for additional screening sites. Interestingly, though the film will be in Worcester, there is a distinct lack of Worcester in the film. … So far. Bahati said the first draft of the script for “The Black Cyclone” is complete but does not have any direct reference to the city of Worcester. “It’s still really early in the process,” Bahati said. “We are aware that Worcester played such a large role in Major Taylor’s life. As of this moment, there is no mention of Worcester, but we are still in the pre-production phase of the film. To learn more about the crowdfund campaign check out its page on Indiegogo.com. 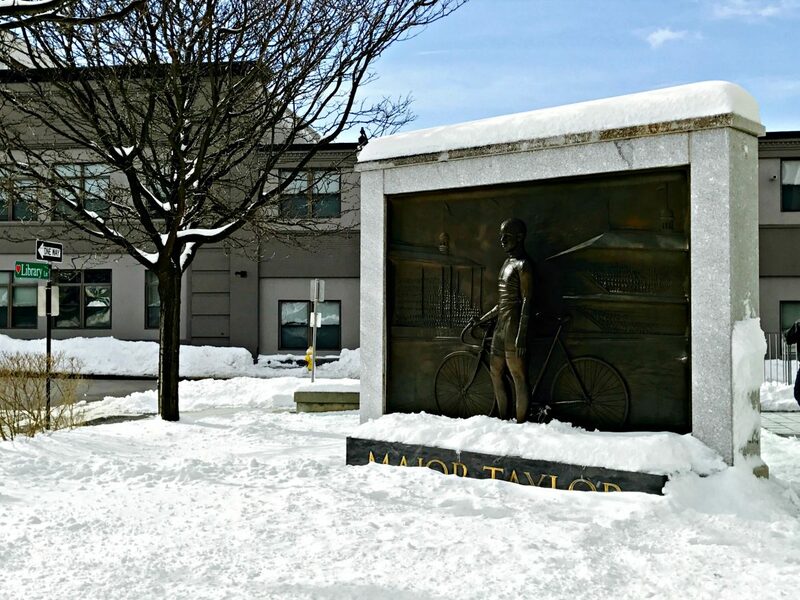 To learn more about Major Taylor and his life in Worcester, visit The Major Taylor Association, Inc.